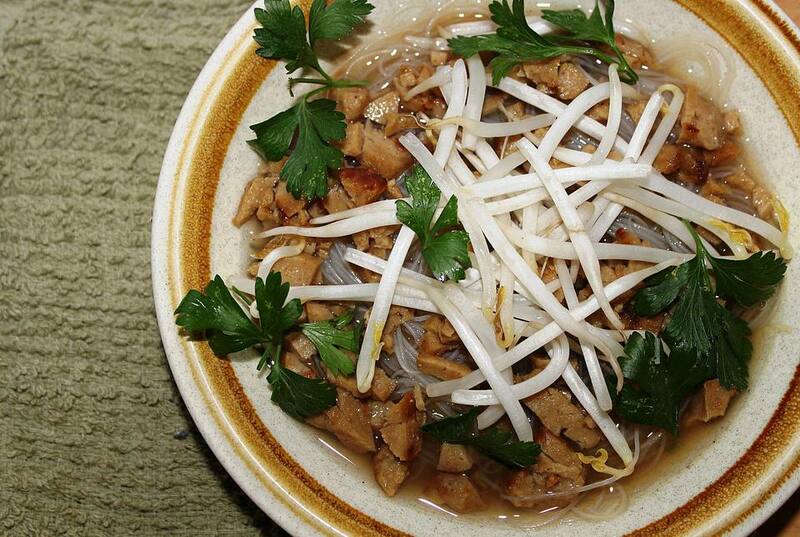 The secret to a good pho is really all in the broth, since that's where all the flavor comes from. The rest is really optional, so add in to or take out of this vegan pho just about whatever you'd like. If you don't have a a few of the spices, not to worry, just add extra of the others, or add a bit of extra Chinese five-spice. Simmer the broth ingredients for 45 minutes to an hour, minimum. Strain the onion, anise, cloves, cinnamon, and ginger out of the broth, and return to a simmer. Add the mushrooms and bok choy and heat, just until vegetables are barely tender, about 2-3 minutes. To serve, divide the prepared noodles between four serving bowls, and top with about a cup of broth with bok choy and mushrooms. Top off each individual bowl with scallions, bean sprouts, basil, cilantro, and chilis. Serve with a fresh lime wedge.